The internet’s role in facilitating people’s choice to engage in personal or professional learning hinges to some degree on the tech assets they have. 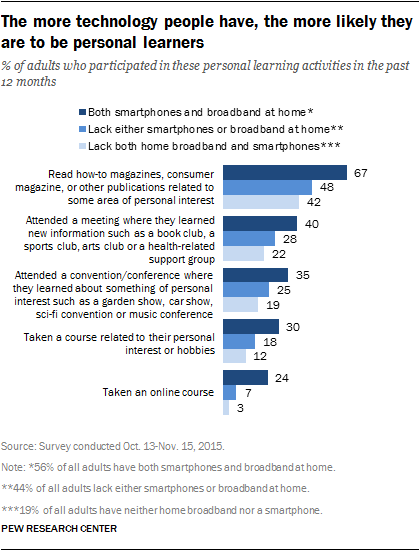 As Pew #research Center has reported, two-thirds of Americans have a smartphone (68%) and another two-thirds have a home broadband connection (67%). 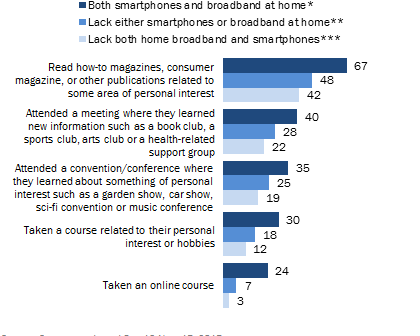 One measure of persistent connectivity is whether people have both a smartphone and a home broadband connection. In the October-November 2015 survey, 56% of adults report having both. This turns out to be a good metric for analyzing the association between tech assets and learning among adults. There’s nothing here you won’t already know but I think it is useful to see the link between mobile phone and broadband access and access to learning. This data also shows adults’ increasing reliance on the web for gaining knowledge.